The much-anticipated update to Windows 8.1 has been leaked – by Microsoft, apparently. Someone noticed that six files containing the revamped OS were available for downloading from the Windows Update site, a month before the official release date. Windows 8.1 Update 1 will feature more obvious power and search buttons on the hated Start screen, and some common-sense updates for those old-fashioned "mouse and keyboard" users. Booting directly to the familiar Windows desktop on non-touch devices will be the most popular change. Try reading at the rate of 500 words per minute. You’ll find it surprisingly easy with Spritz, a new ebook app debuting on Samsung smartphones that finds the Optimal Recognition Point of every word, highlights it in red, and puts it in the right place on screen to minimize your eyes’ work. 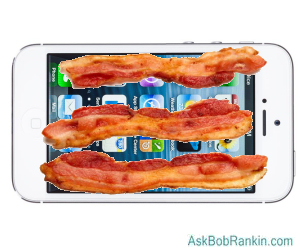 The first iOS app that wakes you up to the sizzle and savour of bacon is free… but you’ll have to compete for it. Oscar Meyer invites you to apply before April 5, 2014, for a random shot at the limited-edition Wake Up and Smell The Bacon App and its companion hardware that plugs into a phone and releases the sweet, sweet scent. “Synthetic” identity fraud is growing exponentially. Instead of stealing a real person’s identity, scammers simply create a fictitious person out of thin air and build a portfolio of driver’s license, business registrations, credit cards, and bank loans around it. After years of patiently building up credit, the scammers abscond with a big haul. “Love me or leave me,” says Marissa Mayer, CEO of Yahoo! Users of Yahoo services will have to register a Yahoo account instead of signing in with the user IDs or competitors such as Facebook and Google. The change began March 3, 2014, with Yahoo Sports Tourney Pick’em, just in time for the NCAA “March Madness” tournament, and will be extended to other services over an unspecified period. "Drill, Baby, Drill?" How did p**n movies end up on the website of the Ohio Department of Natural Resources? Well, the department uses that server to receive large files, such as map data, via FTP. But there is no password required and the FTP site is outside of the firewall, so anyone can upload anything they like. And it appears they do. Over 600 complaints against Delhi, India’s police that a citizens’ watchdog group forwarded to a police portal website have languished since 2008 because police can’t find their password to the file server. That would never happen here in the USA, would it? The father of Bitcoin really is named Satoshi Nakamoto, if you believe Newsweek reporter Leah McGrath Goodman. In a tedious tale, she claims to have sniffed out the virtual currency creator’s secret identity and tracked him down at a modest home in Temple City, CA. His current name is Dorian Nakamoto; he’s 64; and he called the cops on Goodman. The rest is kind of boring and incredible; sheriff’s deputies don’t talk that way, in my experience. T-mobile is doubling the data allotment of its cheapest contract plan to 1 GB per month. Simple Choice plan customers will also be able to use their phones as mobile hotspots for the first time. Chalk it up to competition. Most recent comments on "Geekly Update - 12 March 2014"
"Synthetic" identity fraud? Hmmmm.....shades of Andy Dufresne. He had to go to prison to become a criminal. "...swam through a river of sh*t, and came clean out other side." Thanks Bob, for the story by Newsweek reporter Leah McGrath Goodman on Satoshi Nakamoto. You're right, incredible story.